Wassup! : Why diss Al Gore? Lately I've seen "news" talk show guests who deny there is such a thing as global warming or a climate crisis. They say sure, it's a couple degrees warmer, but hey, it's not serious and people are silly for getting so "hysterical" about it. Then they try discrediting Al Gore personally, accusing him of all sorts, including hypocrisy and manipulating scientific data, then claim there is no scientific evidence to prove there are any problems with our climate. That weather is happening just as it should. I've not seen them sharing any facts. One anti-Gore spokesman only made generalisations and personal accusations against him without presenting one "fact" or suggesting one place we could verify his statements about what he claimed was Gore twisting scientific data. It was a personal attack, not an attack on, or correction of, data. Gore has, for decades, been in the fight to secure and preserve a healthy environment - and he's stepped on a few political and corporate toes along the way. Here's my question: why would anyone want to diss achieving a healthy environment? I wondered if multinational corporations selling products they want us to buy that are not in our best environmental interest might be involved. I've been pretty careful with my resources over the years, I tend to live pretty modestly. I lived with someone who was wasteful for a few years and it nearly drove me crazy. She thought she was "normal," that I was a extreme. Um, I've known people who are extreme environmentalists and I'm not one of them, though I've decided to become even more serious about conserving resources. At any rate, what I came away with after watching foes who personally attack Al Gore instead of the specific science used by environmentalists to prove we are in a climate crisis - caused by people and animals and an disappearing rain forest presence - is that they look and behave untrustworthy. Al Gore's been selling his ideas with facts, scientific data and projections determined by people who have been investigating these issues for decades with information we've been tracking more than a century. Some scientists working with the Bush administration who believe we are in a climate crisis have been fired, told to rewrite their summations or had them rewritten to reflect the lack of a climate crisis. One detailed example of Bush's Department of the Interior tampering with scientific evidence involving endangered species is reported here. Usually these types of cover ups don't come out until after an administration is out of office because of the power they use to manipulate facts while they hold government employees/scientists in their grip. 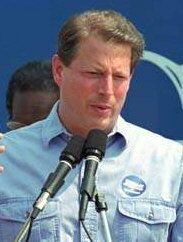 So here's a tip to those who try to discredit Al Gore when it comes to environmental causes: you look foolish. You look like you don't know what you're talking about. Even if you might have some credible information. 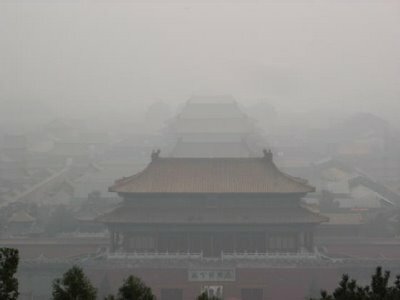 If you honestly believe that the climate crisis is no crisis at all; that the earth really is doing OK; that the loss of rain forests, industrial pollution, oil-burning vehicles, animal gases, chemical dumping and oil spills are not actually seriously affecting the planet in a negative way? Speaking of which, here's a snapshot of The Lost City in China blanketed with "imaginary" pollution, which some scientists claim is contributing the "imaginary" climate crisis. If you suffer from asthma or other imagined pulmonary diseases, you are warned not to be outside during actual events of environmental particle poison. Show us scientific research and reports. There used to be arguments about the environment that went: well, you can have a clean environment or you can have jobs. One or the other. People wanted jobs, only to see themselves and their families get sick and die from the pollution that was the byproduct of those jobs. The Asarco smelter in Tacoma, Washington, USA is a perfect example. In addition to all the people and plants its pollution harmed, it exuded a putrid odor for *miles* around, which created the city's slogan, "Tacoma has an aroma." There used to be arguments by the tobacco companies that smoking tobacco was actually good for us. Seriously. They even used doctors to say so. For decades they swore there was no scientific evidence that smoking tobacco caused lung diseases and discredited people who insisted there was. In fact there was scientific evidence proving smoking tobacco caused lung diseases in the 1950's in England. It's a famous report now, but it was debunked when it came out. If you're interested in a little history of the fight between the multinational tobacco corporations and those who insisted smoking is bad for our health, you can read it here. Second hand smoke contributes to pollution and diseases. That smoke doesn't just disappear when people smoke outside. There's another auspicious aspect to "climate crisis/global warming." For some reason that will be known in the future, it is not a priority of the US government, particularly of the Bush administration. Perhaps they're upset that someone else is setting a priority for us when they believe they should be setting our priorities. This doesn't fit their agenda. Why it would not is very curious, indeed. I mean, no one has excluded anyone with a different position about the subject of climate crisis. We're all looking for the truth and how to improve our planet - all credible research and data is welcome. But we're sick to death of being told what - or whom - we should be against. Of the government trying to scare us into doing - or not doing - something. Being for a clean environment is something that unites, not divides, us. How to make it cleaner, healthier - working together, everyone contributing. Why wouldn't someone want to contribute to a healthier, cleaner, safer, more beautiful world? Understand that and you'll understand the people who speak against efforts to truthfully clear the air. As a human being, I assume he has faults. As a leader who is honestly trying to find what we can do to improve our environment on a global basis, he comes across as truthful, sincere and dedicated to a cause he knows is much bigger than himself. Because Al Gore is not the Cause. The Cause is the Cause. Lobbyists who personalize the Cause in the form of Al Gore will only catapult him as a martyr-leader of historical proportions, as well as make the Cause of a healthy planet creating renewable resources as major and influential a Cause as the civil rights movement. Come to think of it -- you want to diss Al Gore? Is fairness a US doctrine? WTF?! How to *legally* NOT hire US workers?